See Máire MacNeill, 'The Festival of Lughnasa' (p. 175) for details of the festive assembly held on Donagh Sunday, the last Sunday in July, at the Black Rocks near Bellavally Gap. Benbeg is the 448th highest place in Ireland. Benbeg is the second highest point in county Cavan. Walked up Cuilcagh along the way marked route from the Cuilcagh Mountain Park car park on 31/08/2010. 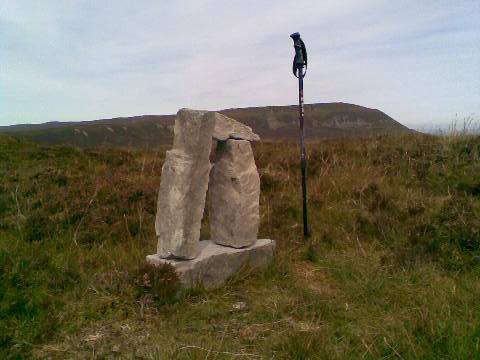 The day was good so I went on south to Benbeg where I found this new looking cairn, not mentioned previously. There were no other rocks around the summit. Is Benbeg now off limits because of mystical forces?